The future of health care remains challenging, and at times uncertain, but the promise of mobile technology improving patient outcomes, lowering costs and creating a seamless patient experience continues to hold true. Mayo Clinic physicians and staff developed and implemented a standardized practice model over a three-year period (2010-2012) that significantly reduced variation and improved predictability of care in adult cardiac surgery. As part of this model, David Cook, M.D., Jeffrey Thompson, Joseph Dearani, M.D., and Sharon Prinsen, R.N., developed the interactive Mayo myCare program, which uses an iPad to give heart patients undergoing elective cardiac surgery the opportunity to be an integral part of their recovery. 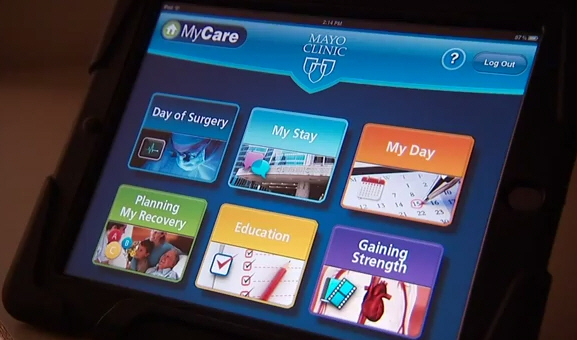 The Mayo team describe how the myCare program gave patients a sense of being in control throughout their recovery process in a recent Harvard Business Review blog post, “How Mayo Clinic is Using iPads to Empower Patients”. The iPad provides patients with access to educational videos, helps answer questions about pain and even tells their providers how much they’ve been able to walk and do since surgery. And if any problems arise care providers are notified immediately. The following video shows how the iPad app is making a difference for patients who have had heart surgery. Preliminary data suggest that patient education and participation through the myCare program can help shorten length of stay, reduce cost of care and improve patient independence after leaving the hospital. The future of the myCare program continues to look bright as Mayo is rebuilding the software platform so it can be used to create and deliver care plans in multiple types of surgical practices such as orthopedics, heart failure and obstetrics. Click here for more information on the myCare program from the Mayo Clinic News Network. Watch for Dr. Noseworthy’s post next week featuring his insights from the World Economic Forum Annual Meeting!